On the move: violinist Vũ Khánh Linh on her way to rehearsal with the Hà Nội New Music Ensemble. Searching for a word or a phrase to describe the members of my Hà Nội New Music Ensemble is a rewarding thought experiment. Doing so back home in Los Angeles is a great cure for massive Southeast Asian jet lag (mixed often, I’m afraid, with a strong dose of post election California blues). 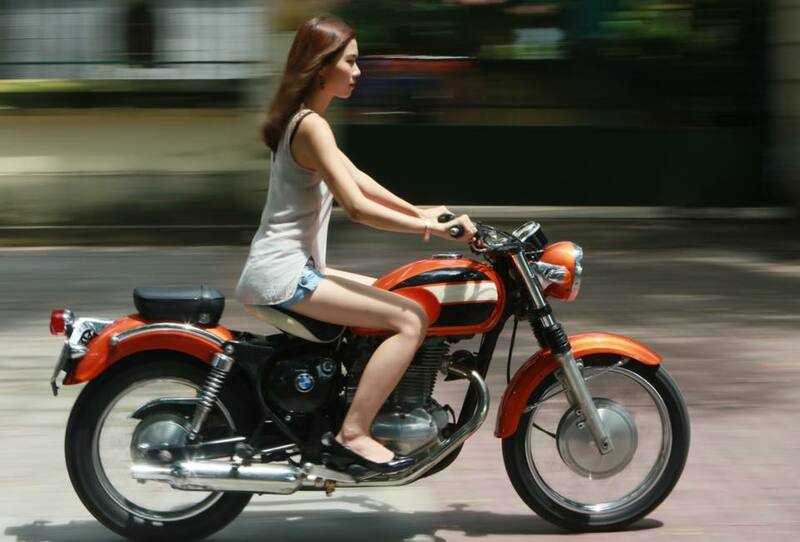 Like Việt Nam itself, there are contradictions, aspirations, habits and desires to be understood in their makeup. But if pressed for a description, here’s my choice. Energy. As in the monster capacity Vietnamese audiences we enjoyed together. And I have to force these players to take a rehearsal break. Or to stop celebrating! 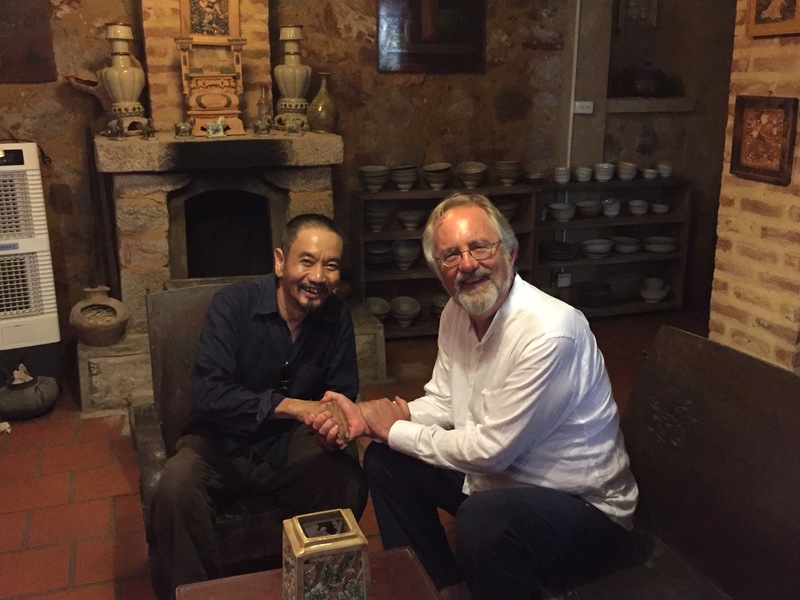 A handshake contract in Bằc Ninh with my good friend Đàm Quang Minh of the Ancient Music Ensemble of Tonkin. I am happy to announce an important development for serious music in Việt Nam. On Friday November 4th at the second concert of the Hà Nội New Music Ensemble we will begin a long term collaboration with the Ancient Music Ensemble of Tonkin. As an American arts advisor to new music here, I’m proud to have been a catalyst for this long overdue fraternity of friends, and should you be in Hà Nội, make plans to join us at 8 PM in the Grand Hall of the Việt Nam National Academy of Music in a concert honoring the 60th anniversary of the Academy’s founding. It’s been quite a busy time since I arrived in early September. Not to mention the monster crowd that greeting our opening concert at L’espace on Sunday! Working on every detail with Vũ Khánh Linh and Giang Dương. Sunday night at 8 PM the Hà Nội New Music Ensemble begins its second season at L’espace, sponsored by the l’Institut français du Việt Nam-Hà Nội. A group whose time is long overdue, I’m honored to be to help these hard working Vietnamese musicians as their artistic advisor and conductor. A triangle of countries, France, Việt Nam and the United States, blends with a triangle of cities, Paris, Hà Nội and Los Angeles, for this second season opener. The new music world potential for my friends is vast, but much hard work has to come first. Excepting the usual suspects of classical music, you name the 20th century composer and you might be leading a Vietnamese premiere! Looking over the horizon, I predict you will see a new music wave in the next few years cresting in Southeast Asia with the emergence of the Hà Nội New Music Ensemble! 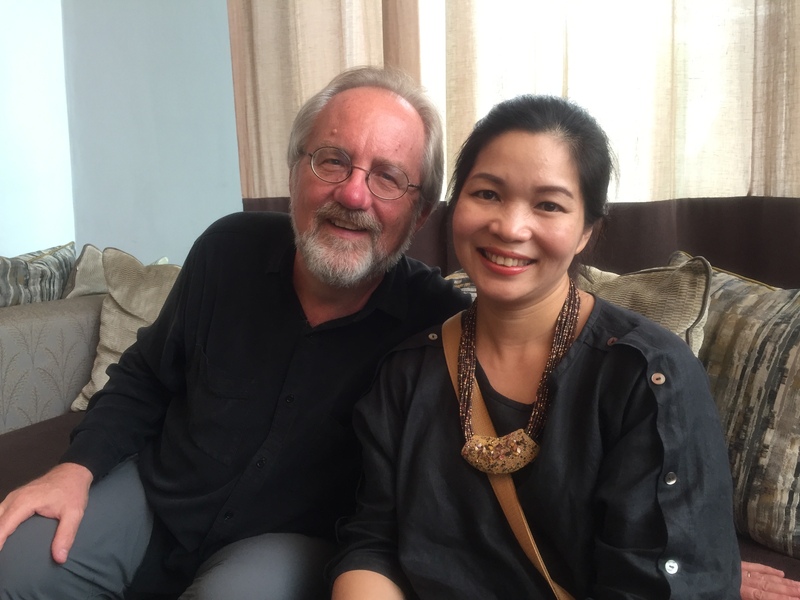 With Trần Thu Thủy, my Vietnamese tutor, the first photo upon arriving in Hà Nội last week. I didn’t leave my heart in San Francisco, even though the City by the Bay is home to some of my oldest dearest friends on Planet Earth. When I have to find where I left my heart, I need to get on an airplane, fly 24 hours (via Tokyo, Taipei or Hong Kong) and begin another chapter, what is now the eighth, in my ongoing love for a country that will always lurk in the background of being an American. I left my heart in Hà Nội, Việt Nam. 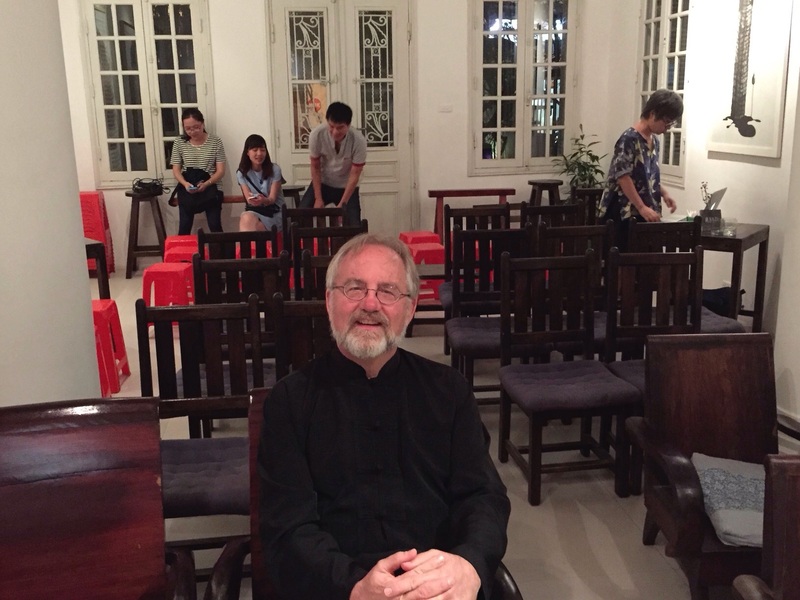 Relaxing before a performance at the Manzi Art Space in Hà Nội. I was just asked yesterday by a good friend, who has never visited Việt Nam, what remains in the country from the era of French colonialism, what might he experience if he visited. Though answering the question could fill a few volumes, I’ll give you a some general observations. The most obvious French echoes, along with influences in Vietnamese cuisine, are the numerous buildings that one encounters all over the country, and not just in Hà Nội. 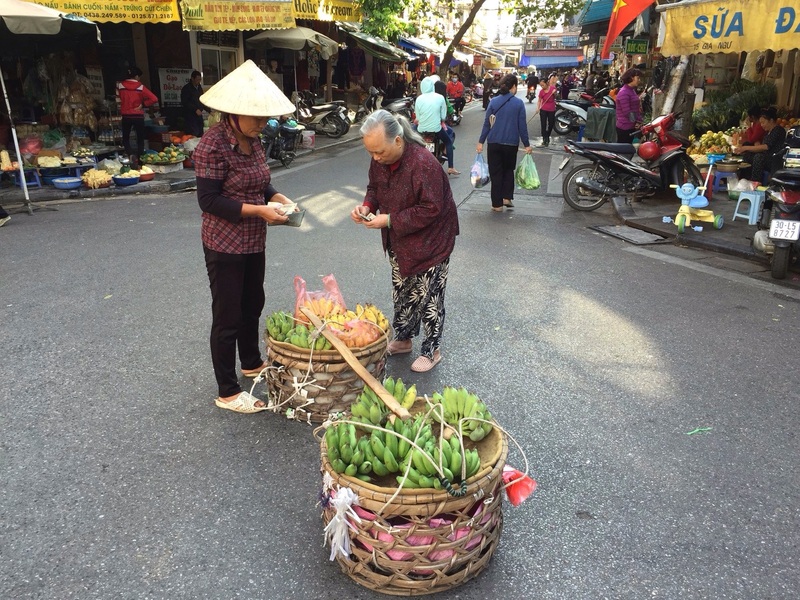 This unique blend of France and Việt Nam accounts for Ambassador Ted Osius’ belief that, after 30 years of service in Asia, he believes Hà Nội is the most beautiful city in a beautiful country. A typical Old Quarter transaction. If I were asked to put my impressions of the Vietnamese on the back of a business card, I’d probably settle on “the most resourceful people on Earth.” My friends there have a way of tunneling under, going around, slicing through, or soaring above any and all situations life throws in their way. Sometimes they do these things simultaneously, which makes working in Vietnam always interesting. 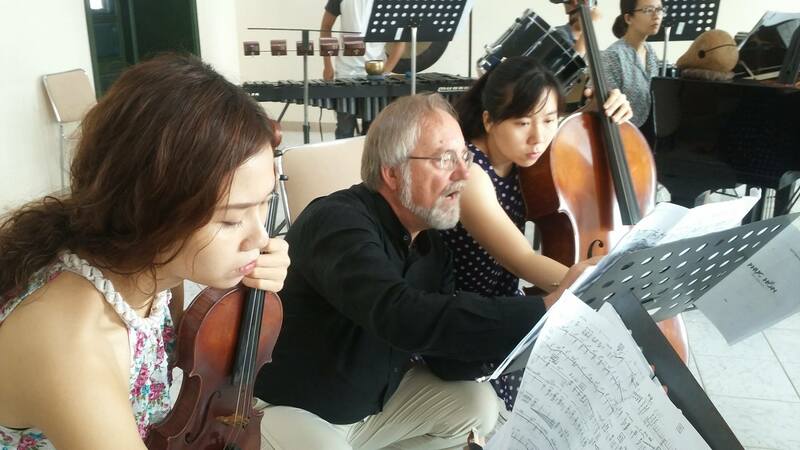 Before I was approached to be an official artistic advisor and conductor to the Hanoi New Music Ensemble, I was made aware of many new developments in the performing arts infrastructure in Hanoi. But one report, of a new cultural center smack in the heart of the intoxicating Old Quarter, helped me go from interested to YES!